An electron gun (also called electron emitter) is an electrical component in some vacuum tubes that produces a narrow, collimated electron beam that has a precise kinetic energy. The largest use is in cathode ray tubes (CRTs), used in nearly all television sets, computer displays and oscilloscopes that are not flat-panel displays. They are also used in field emission displays (FEDs), which are essentially flat-panel displays made out of rows extremely small cathode ray tubes. They are also used in microwave linear beam vacuum tubes such as klystrons, inductive output tubes, travelling wave tubes, and gyrotrons, as well as in scientific instruments such as electron microscopes and particle accelerators. Electron guns may be classified by the type of electric field generation (DC or RF), by emission mechanism (thermionic, photocathode, cold emission, plasmas source), by focusing (pure electrostatic or with magnetic fields), or by the number of electrodes. 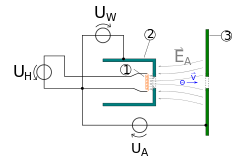 A direct current, electrostatic thermionic electron gun is formed from several parts: a hot cathode, which is heated to create a stream of electrons via thermionic emission, electrodes generating an electric field which focus the beam (such as a Wehnelt cylinder), and one or more anode electrodes which accelerate and further focus the electrons. A large voltage between the cathode and anode accelerates the electrons. A repulsive ring placed between them focuses the electrons onto a small spot on the anode at the expense of a lower extraction field strength on the cathode surface. Often at this spot is a hole so that the electrons that pass through the anode form a collimated beam and finally reach a second anode called a collector. This arrangement is similar to an Einzel lens. Most color cathode ray tubes – such as those used in color televisions – incorporate three electron guns, each one producing a different stream of electrons. Each stream travels through a shadow mask where the electrons will impinge upon either a red, green or blue phosphor to light up a color pixel on the screen. The resultant color that is seen by the viewer will be a combination of these three primary colors. The most common use of electron guns is in cathode ray tubes, which were widely used in computer and television monitors. An electron gun can also be used to ionize particles by adding or removing electrons from an atom. This technology is sometimes used in mass spectrometry in a process called electron ionization to ionize vaporized or gaseous particles. More powerful electron guns are used for welding, metal coating, 3D metal printers, metal powder production and vacuum furnaces. A nanocoulombmeter in combination with a Faraday cup can be used to detect and measure the beams emitted from electron gun and ion guns. Another way to detect electron beams from an electron gun is by using a phosphor screen which will glow when struck by an electron.